Beccles Free School: Is the "demand" from parents real? In their consultation document the Seckford Foundation claim that some 513 people have expressed an interest in the Beccles Free School. On the basis of the research it has carried out and the feedback from parents and others received so far, the Trust firmly believes that there is a need and demand for a school of the standard of the proposed School. The proposed School received strong support from parents and the community in May 2011 (513 expressions of interest across all year groups). The four people who were leading the process were Tony Callaghan who the Seckford Foundation disowned yesterday in strong terms after this Blog revealed his online posting together with Aidan McHugh and Mark Chapman who are Beccles Middle School Governors and Melanie Tucker who runs an educational consultancy called MTM consulting in Southwold. For those not familiar with Suffolk geography Southwold is some 15 miles and 35 minutes drive from Beccles. It is also a Town in its own right. Update: It has been pointed out to me that Beccles is however the catchment secondary for Southwold and Reydon so clearly people in this area do have a legitimate interest. Now it is interesting to see how the Seckford Foundation describe the original proposers in their consultation document. I think it is something of a stretch to describe Southwold as a surrounding village to Beccles. Update: although it is part of Beccles catchment. Certainly this would not go down well in Southwold. It's a bit like saying Woodbridge is a village surrounding Ipswich! Tony Callaghan apparently lived in Alpington, Norfolk 12 miles and 20 minutes drive away and nearer to Norwich. Of course this is closer than his new home in Florida! So it appears that actually only half of the original team fit this description. Update: I am perhaps being a bit unfair on Melanie Tucker as she has a legitimate interest as a Southwold resident but this still applies to Tony Callaghan. This sets something of the context for the two main reasons I think that the demand alleged by the Seckford Foundation is significantly higher than the real demand. This has been an issue that has concerned me as this data seems to contradict the situation on the ground in Beccles. In common with several bids for free schools in Suffolk very unhelpfully the bids have become entangled with attempts to save Middle Schools. 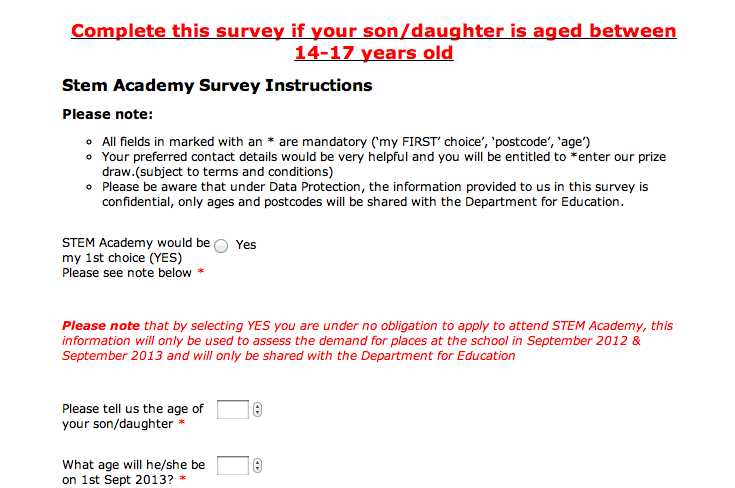 Something that there is certainly genuine parental support in some number to do. At least two of the proposers played a leading role in these "save middle school" campaigns and parents at the Middle School were targeted at school functions to sign the expressions of interest for the free school. Now this might be fine but there have been allegations that they were told it was to "save the middle school" and there was no verbal mention of a free school. Apparently a large banner was on display with the words "Save Beccles Middle School" on it. My earlier blog posting showed that Tony Callaghan has been shown to be lying about the free school bid. In January he was still claiming to be part of the proposers and telling the TES Forums that all middle school staff would be employed - which Seckford's website shows is untrue - and that each child would receive a free iPad. My view is the involvement of Callaghan and these allegations make the data extremely unreliable and Seckford Foundation have been ill advised to rely on data collected by other people without examining how it was obtained. Originally the Free School was meant to be opened at the Beccles Middle School site but there was the small matter that this site had already been promised to Sir John Leman High School who needed it to accommodate children moving to it from the Middle School. So the plans were changed so that the school would open in Carlton Colville for two years and then move to the Middle School site. Now if you see the map above again you can see that Carlton Colville is not in Beccles. It is 7.5 miles and 20 minutes drive away. 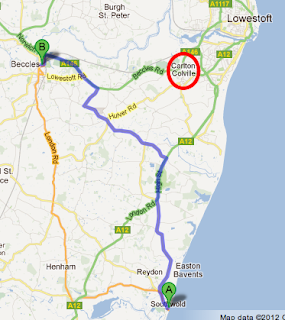 In fact Carlton Colville is nearer to Lowestoft than Beccles. Parents who might have wanted their children to go to school in Beccles at Free School there cannot be assumed to want to travel this distance to another town. Others have expressed both concerns about the site's suitability - it is currently a primary not secondary school so does not have facilities like science labs - and also about disruption to the school when two years after opening it moves. This casts further doubt on the demand. It does not seem at all sensible to conclude that demand is transferrable in this way. 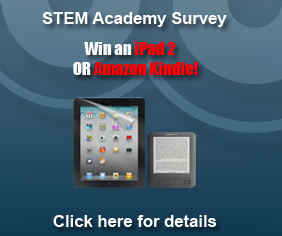 A free iPad if you complete our survey! When I first saw this article on Local Schools Network today I though it might have been about Beccles Free School as a free iPad was mentioned! 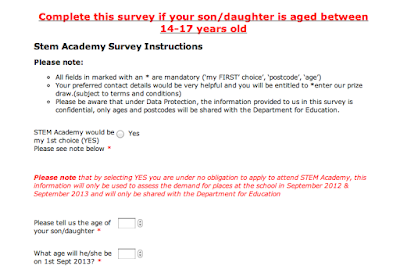 In fact it is not but it provides yet another even more blatant attempt to show demand by the STEM Academy in London, a proposed 13-19 Academy. Given the importance the DfE rightly gives to demand it is perhaps not suprising that groups are desperate to use all means possible to get the required numbers of expressions of interest. In the Beccles case the data is so flawed and unreliable in my view that the Seckford Foundation should conduct a completely new survey from scratch if they are serious about their claim that if, contrary to our understanding, the desire is not there, then we will have no wish to impose a free school on the community.